Marketing is often times a dirty word. That is because we see bad marketing all the time. Effective marketing tells a story that the end user can relate to. So the trick with marketing is creating the narrative; and how do you do that? What does story telling have to do with pouring concrete foundations or smelting steel? On the surface it doesn’t, but building a lasting product that will get the client from one stage in life to the next is a story that anyone can buy into and that your business can key into so that potential clients can begin to see the vision you offer. The simple solution to this, which is often times the least effective, is to simply hire a marketing firm and hand the task over to them. Before you do that, you need to ask yourself what is the point of marketing for my business? This not an existential question per se, but if you look at effective marketing you can see this question being answered in action. Why would an energy drink company sponsor a race car team? Because that energy drink company knows its target audience watches that type of racing. And therein lays one of the most important pieces of information when it comes to marketing. Who am I trying to sell my business to? Managing your client base and client information is the key to answering this question. Keeping a database of your past clients will give you the data you need in order to determine who you are marketing to, where to market to them and more importantly, what type of potential client you want to attract. Having this data is one thing, converting it into useful information is another. Integrated software is the key to converting this data otherwise you are left with having your management combing through this data trying to mine it for gems, which is wasteful. A managed client database like the one that an integrated business system, like Sage 200 and Sage CRM provide, is a fast and effective way to find out where your clients live and where they work. Take that information and you can now have a reference to search out where new clients might reside. So now you have an idea of who you are targeting and a better idea of where to find them. The next question is what do you want to say to them? How do you convey to potential consumers, clients or customers that what you offer is what they want? The modern consumer has been bombarded with marketing materials all his life and sooner or later he will become inured to certain practices. Nothing is more offensive to a potential client or customer than the feeling that they are being marketed to. So by managing a client database with a CRM integrated with your accounts software like Sage 200 CRM you can understand your target audience and communicate to them in a respectful and effective way to inform them of your business and how your business can benefit their needs. 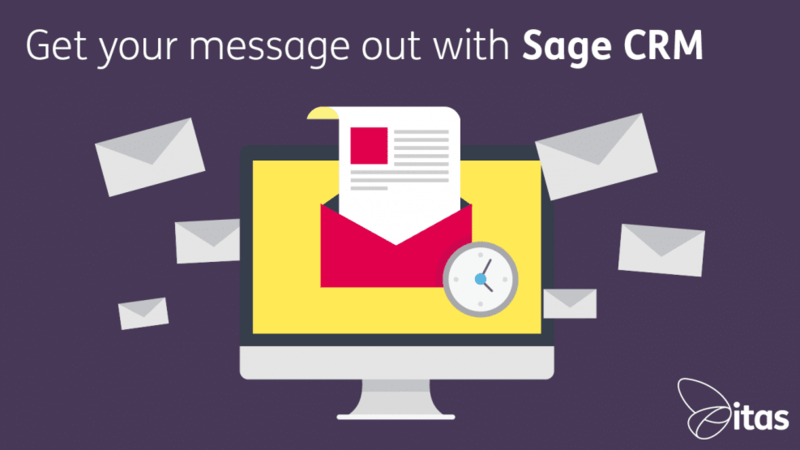 Not only that but you can save time with Sage CRM’s integrated e-marketing solution. Integration with a variety of tools including Swiftpage, Communigator and Wow Analytics allows you to minimise the time you spend on marketing. Marketing is a conversation. You have to have a good idea to communicate and while hiring a marketing firm to do this for you might seem like the logical solution, if you don’t know what you are trying to communicate then even the best marketing firm will be left wrong-footed when trying to market your business. Before you decide which direction to go in, whether you outsource your marketing or keep it in house. Determine who you are trying to reach and what you want to say to them. That way when you get their attention, you’re not wasting a potential client’s time.